Dennis Rodman has made a fourth visit to North Korea to visit his old pal Kim Jong-un. The two hit it off over a mutual love of basketball. Rodman has been criticized for being an instrument of North Korean propaganda. Critics say he’s only shown the side of North Korea that the regime wants him to see, and is therefore given a false and misleading image of how the regime treats its citizens. But Rodman says he sees it as a diplomatic opportunity—a chance to bridge the divide between two nations and talk about differences. 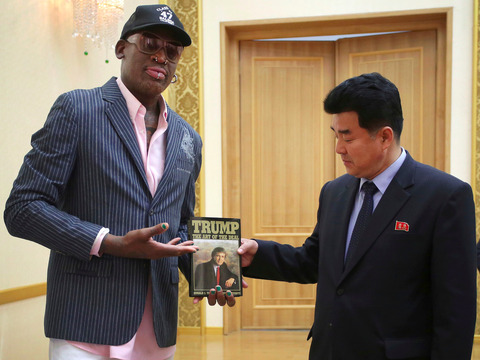 Rodman even presented Kim with Trump’s book The Art of the Deal. If Rodman could broker a nuclear deal, could he become the first NBA star to win a Nobel peace prize?